In a lot of ways we are our own worst enemy. We self-sabotage. We procrastinate. We put roadblocks in our own way, and we make excuses for our behavior to make us feel better ourselves when things don’t go our way. We all do it, but why? And is there something we can do about it? 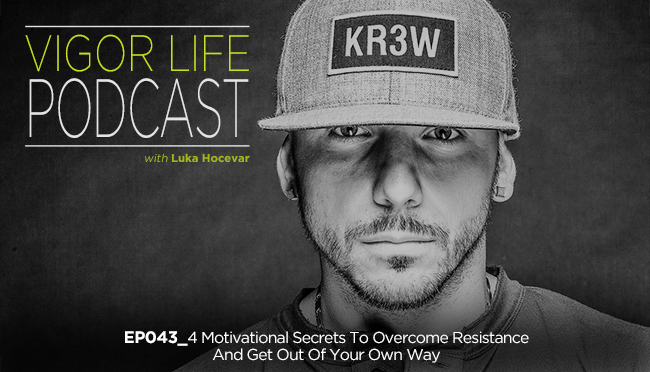 The simple answer is yes, and in this episode I get into how so that you can get out of your own way and finally make things happen for yourself. This entry was posted in Podcasts and tagged athletic development, Athletic Training, Business, Entrepreneurship, Fear, Fitness, Goals, Happiness, Life, Mindset, Motivation, Nutrition, Performance, Personal Development, Podcast, Self Development, Self Help, Success, Training, Transformation, VigorLife. Bookmark the permalink.